Had no problems at first playing the kids cartoons that were 4:3 resized to 16:9 in the system/video/playback section. Videos were stretched to full screen and all was good. Then it seems like all of a sudden no matter what I do Everytime I start playing a 4:3 video it's smashed horizontally like meat between 2 buns! No matter what I change the default view in settings for playback of 4:3 videos it's still smashed and 2 huge black bars on the top and bottom. If I change the video size during playback it will go back to normal and if I set the default view to stretch to 16:9 it will fix this. But then all the 2.3:1 videos are stretched long ways. I'm thinking there's a button one of my kids hit or a setting they changed but I just can't find it and it's driving me nuts! I too had this problem, all was OK 4:3 stretched to 16:9, then for no reason I could find was "smashed horizontally like meat between 2 buns!". No kids, only me had access to my box and I don't know what I did to cause it. My only solution was to rebuild my Kodi configuration from scratch and it was then OK again and is still OK some weeks later. I now take .kodi backups in case it happens again. (2016-07-16, 09:17)Jeffers24 Wrote: [ -> ] I too had this problem, all was OK 4:3 stretched to 16:9, then for no reason I could find was "smashed horizontally like meat between 2 buns!". I just rebuilt mine and the problem is still there. Even used aeon nox instead of Titan thinking maybe that was the problem.. I'm thinking it's a setting on the box because I've only had this problem on my q box and never on any of my 3 Nexus players. I don't think it's a box setting as I don't remember changing any box settings. When I copied my .kodi folder from one box to another the problem followed! Uninstall Kodi then do a clean Kodi install, I use stable 16.1 from the play store. Then only install UK Juke Box addon from Kodi registry, search on year 1989 and play Simple Minds Belfast Child see if it plays OK, should be 4:3, Then change settings in Kodi to play 4:3 to stretch 16:9 and see how it plays. This is my test video to see if the problem returns or not after making changes. 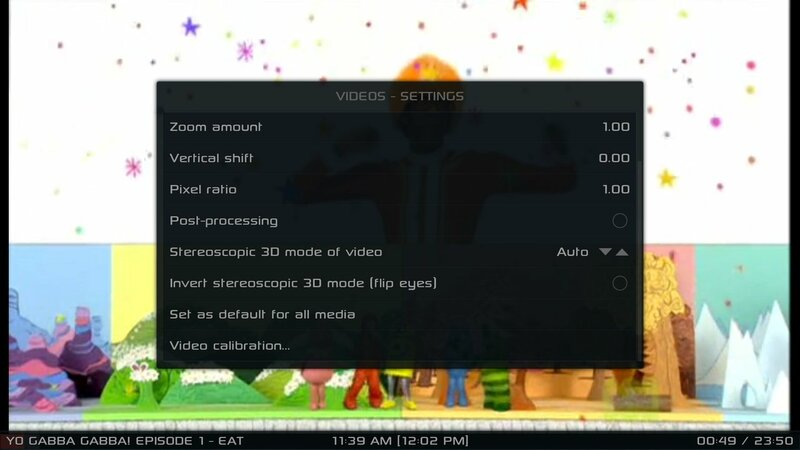 If still nothing, when watching a video, click the video settings. Set as default for all media. See if any of that works. Awesome. Thanks for the tips. I always usually set in settings to display 4:3 videos as stretch to 16:9 and I tried 16:9 non linear. 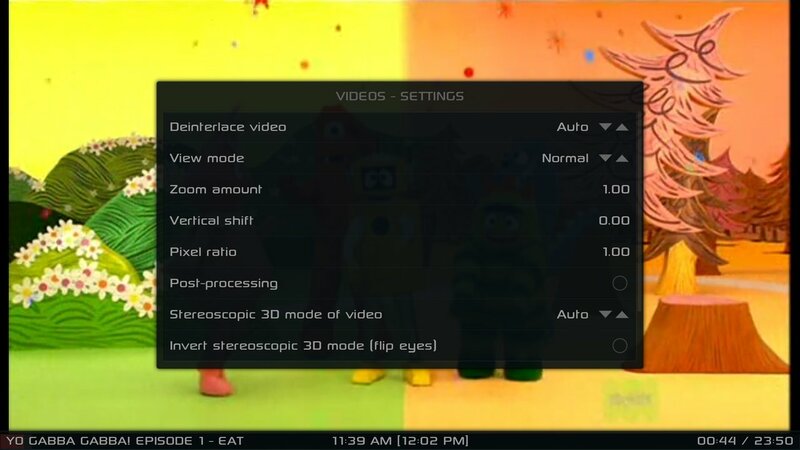 I believe I've tried everything in the video settings while the video is playing also. But I will try again when I get home. Well I'm checking the options on my phone as that's what I use for all my kodi builds. And I don't see a nonlinear stretch option. While the video is playing. Is there anywhere else to find this? These screenshots are taken after I set video to stretch to 16:9 non linear under settings. Def going to want a debug log. Sounds like something is donked on your box. Also, odd that the options aren't present. The specialty boxes are always a little difficult as they use their own odd builds. Good luck getting those Yo Gabba songs out of your head. Once you hear it, you can't unhear it. I can't even find episodes. I've acquired a few dozen from transfers and such, but I can't find any official digital releases anywhere. I tried buying several places, and they aren't quite right. The hunt continues. Fun Fact: My current wallet is a DJ Lance wallet. I have a Minix Neo U1 running stable Kodi 16.1 and I don't have the settings. Like Cody I have no non-linear stretch option when streaming a video. With above settings I am NOT experiencing the 'squashed hamburger' affect. When I got the 'Squashed Hamburger' effect I don't know why I got it it just happened and I could not get rid of it by changing settings. I had to rebuild my Kodi config from a cleam 16.1 install and it has not happened again since I did this. Odd that it would be left out. I hope Cody can supply requested debug log while he still has the problem as the only way I could get rid of the issue was to redo my Kodi build. Not sure about it being a Minix thing as the problem followed when I copied my Kodi config from the Minix to a non- Minix box. I could not connect to the link in your email? (2016-07-20, 07:43)Jeffers24 Wrote: [ -> ] I hope Cody can supply requested debug log while he still has the problem as the only way I could get rid of the issue was to redo my Kodi build. Well.. so far it's stopped happening to me, thank God!! All I changed last night was to put 4:3 to stretch to 16:9 non linear in settings. I went to a 4:3 video and was expecting no change, and lo and behold, it's fixed! For now anyway. But like I've said in the past., I had literally tried every setting. I'd even change settings, reboot kodi, or change settings, reboot the box. Everything. Nothing worked. I dunno what was different about last night. But if it jacks up again I'll def grab a log. Thanks everyone for they're suggestions! Well. The problem was fixed for about a day. The next time I started kodi the problem came back. Log uploader is giving me an error so I just copied the kodi.log file after the problem happened. I hope someone can make sense of this!